It’s important to stay hydrated throughout the day. Water is the best beverage choice and there are ways we can enhance not only the flavor but add nutrition, too. Infusing water with fruit and spices serves that purpose. Here we offer an apple cinnamon infusion recipe that will not only encourage you to drink water but add detoxifiers and energy boosters in the mix. Antioxidants quercetin, catechin, phloridzin, and chlorogenic acid – apples are the primary source of phytochemical phenolics (a type of flavonoid antioxidant) consumed in the U.S.A.
• Nutritional fiber – pectin in apples have been found to lower cholesterol, moderate blood pressure, and promote healthy digestion. The soluble fiber in apples detoxifies by pushing waste through the colon, like digestive Drano. It also slows the metabolism of carbohydrates, regulating blood sugar. • Vitamin C – while the actual content in an apple is modest at about ten percent of the daily recommended amount, an apple a day will surely help keep the doctor away—even a dermatologist: vitamin C is an important catalyst in the production of collagen, key to wound healing and skin health. • Speeds metabolism by moderating blood sugar and improving insulin sensitivity through antioxidant phytonutrients and chromium content. • Rich in calcium, fiber, and manganese. There are two ways to make this detoxifying water infusion—whichever you choose, you’ll get the formidable one-two of the apple-cinnamon punch. Any variety of apples will do but you might consider a green one—Granny Smiths contain more fiber than other kinds and it’s the fiber that is so key to detox and weight loss. 1. Place apple slices in a large glass (or ceramic) pitcher; reserve a few to add directly to your glass. 2. Place cinnamon stick on the apple slices. 3. Fill pitcher half-way with ice, then the rest of the way with water. 1. Bring water to a simmer over medium heat. 2. Add apple slices and cinnamon sticks. 3. Simmer 15 minutes, remove from heat, and allow to cool to room temperature. 4. Pour into a glass (or ceramic) pitcher and refrigerate. For both recipes, drink an eight-ounce glass of the infused water thirty minutes before each meal for at least three servings every day. 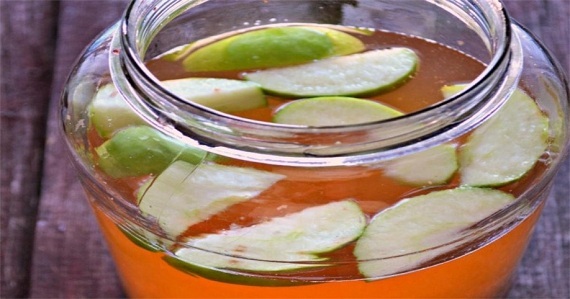 You can re-use the apples and cinnamon sticks in the pitcher for three or four days before replenishing with new ones. Next post: Take 2 Tablespoons of This Miracle Every Day and You Won’t Have to Go to the Gym Ever Again!